Cornelia Funke hardly needs an introduction. The author of Dragon Rider, Thief Lord, Inkheart and Inkspell for older children is in her element in this book about knights and castles, magic and war for younger children. She has also done the illustrations herself. Igraine, daughter of celebrated magicians the Fair Melisande and Sir Lamorak the Witty, is about to celebrate her 12th birthday in Pimpernel Castle. The castle has been the family’s home for hundreds of years and Igraine has just one ambition: to grow up and become a knight. With just a day to go before her birthday, her parents and brother Albert, an aspiring young magician, are cooking up a magical gift for her. The young girl, in the meantime, skips all around the castle waiting impatiently for the present to be ready. It is then that two events — occurring in rapid succession — shatter the idyll. The family gets a message that the evil and greedy Osmund, nephew of their good neighbour the Baroness of Darkrock, plans to capture Pimpernel Castle and take away the singing magic books that Igraine’s parents treasure. Immediately after this, a mispronounced word during the magic chant turns Sir Lamorak and his wife into pigs. The only way they can get back their human forms is if someone gets a giant’s red hair and uses it to whip up a new spell. Igraine decides to pitch in as time is running out. She puts on her birthday gift — a spanking new knight’s armour — and manages to steal the fastest horse (it belongs to the Baroness) in the kingdom from right under the enemy’s nose. Even as hostilities commence at the castle gates, she rides out on her quest, leaving Albert to hold the fort. 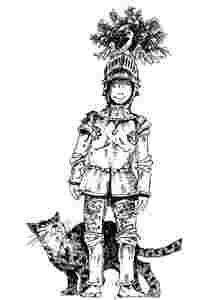 Albert has to use all the magical powers at his command and stave off Osmund — no mean magician himself — and his castellan, the Spiky Knight or Iron Hedgehog, as he is called. Braveheart: She steals the kingdom. Igraine finds the giant, gets the hair and some help in the form of the Sorrowful Knight of the Mount of Tears, a friend of the giant. The Sorrowful Knight’s actual name is Sir Urban of Wintergreen, who has his own code of ethics. He vows to help the brave Igraine when he discovers that Iron Hedgehog is on the enemy’s side. The Sorrowful Knight had been on the receiving end of the former’s trickery more than once. Time is running out as the duo return. Albert is increasingly finding it difficult to hang on. Can Pimpernel Castle be saved and the villains vanquished? 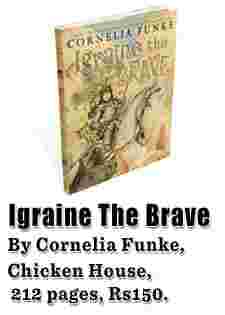 Igraine the Brave has been translated from the German by Anthea Bell — remember the Asterix comic books? Nothing much seems to have been lost in translation. The narrative is lucid and never flags. The sudden twists and turns in the plot are gripping enough. Funke, who is a German, lives in the US. She finds that magic and fantasy form the best platforms for the most interesting plots while writing fiction. Funke’s other books for younger children include the Ghosthunter series, When Santa Fell to Earth, and a number of picture books too.